Why is Apple inviting fashion editors and bloggers to tomorrow’s launch? It’s widely known now that Apple will debut the iPhone 6 tomorrow at a mega press conference. Just how mega? Well, we’re used to seeing quite the tech audience for these sort of announcements, but there will be a slight twist to tomorrow’s events. Apple have invited the fashion family. WWD tells us that Magazine editors, as well as top bloggers, have all been invited to the grand unveiling at Apple tomorrow. So what does it all mean? Well, let’s take a step back and look at some important hires for Apple over the past year. First, Apple scored Angela Ahrendts from Burberry, a great loss for us here in London. They also scooped up a former Vice President of the watch brand Tag Heuer, and let’s not forget the former CEO of Yves Saint Laurent. Apple has gone full fashion with its new network of in house professionals. But that could all just be because they’re talented individuals and Apple likes to think outside the box. 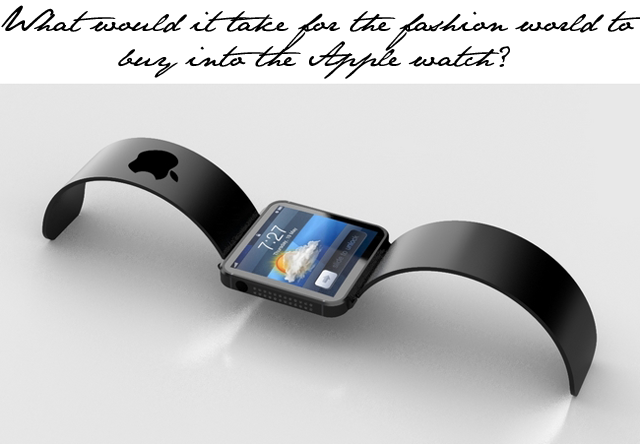 Or could it be that Apple is launching something fashion related? Sure seems that way if they’re inviting fashion folks to the frontlines for the first time. The simple word on the street is that a watch is coming at us tomorrow. Boring. I mean, great, but also kind of boring as we’ve known this was in the works forever. So here’s what I’m hoping for in this special watch, if that is indeed what we’re all waiting to be introduced to. -It needs to be able to take video and photos, straight from the watch, so I can avoid that awkward moment on the catwalk when you’re mobile phone is blocking someone else’s. -The Apple watch should be able to tell me when I’m about to blow a gasket. As in, it should have a blood pressure monitor. There’s only so much pushing and shoving in line at fashion week I can take without feeling like my heart is going to blow right out of my chest. -My Apple watch will have a scrollable closet. You know the one like Cher has in Clueless, except miniature. I should be able to scroll through my entire collection and choose the next day’s outfits without budging from my seat at Burberry. -Wake up feature. We all know it’s all about catnaps at fashion week so I want my Apple watch to have shock therapy installed. If I’m out for longer than 20 minutes I’ll need a cattle-prode like shock to throw me back into work. -Scrollable style.com. Shouldn’t that come standard on every Apple watch? -A pop-out energy field to protect me when it rains cats and dogs between shows. The watch will sense moisture in the air and instantly give me waterproof protection, including a special force-field for keeping humidity hair at bay. Come on Apple, all those things are totally doable. Let’s make this happen.